This burrito brought tears to my eyes. Not because it was spicy. Not because it was difficult to make. But because this is the burrito of my childhood. Last fall I shared a recipe for my childhood favorite restaurant salsa. 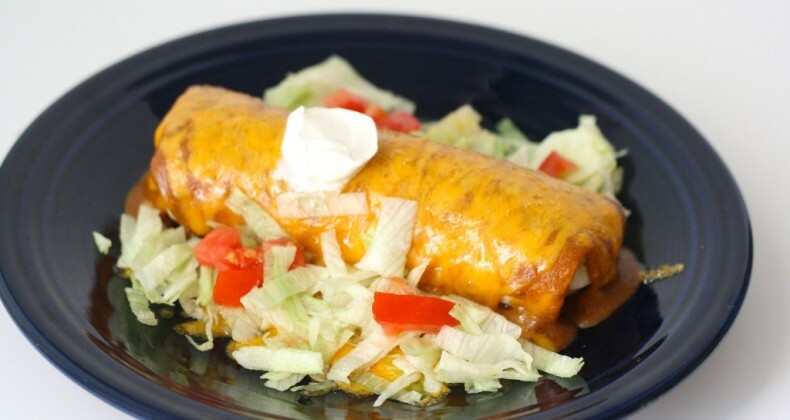 You see this burrito is a burrito I would get cravings for when I left home the first time. College was four hours away from this restaurant and I usually went home on holidays which meant that the wait time and lines were long. These days I am living closer to home but still far enough away that I don’t get to eat there very often. I love a challenge in the kitchen and this burrito was a challenge. Over the years I have slowly picked apart some of the important components. The ground beef Â in the burrito is no longer a secret to me. I posted about it years ago. The refried beans are still a mystery. If you know how to make runny refried beans please let me know! As for now I am purchasing the most delicious refried beans from my favorite Mexican grocery store. This gravy makes an ordinary burrito extraordinary. What would you rather have, a plain ole boring burrito or, one smothered in gravy and cheese and topped with lettuce, tomato, and onion? I hope you chose the smothered one! You will have to plan ahead a bit since the ground beef takes a hour to cook. Trust me for the softest and most flavorful ground beef you will want to follow my Mexican Ground Beef recipe. You could always just brown the ground beef if you are in a time crunch but it won’t be the same. Mix up a batch of margaritas and snack on some chips and salsa and pretend every day is cinco de Mayo! Ole! Place all ingredients in a large pan over high heat. Bring to boil. Turn down to medium/medium low heat and simmer for 1 hour. Use a potato masher to break apart the meat. This does look really good! I like chili on brats and on burritos. Haha! HOT PLATE! made me laugh out loud. I just wiped drool off my keyboard. Need to have merrill burritos STAT. The chili gravy was too spicy for my family. Maybe I should not add the Hot Chili Powder?? ?